This piece was originally designed to be blue to depict the skys, since the images are of constellations. However, it was changed to orange to blend in with the colors of Joe Louis Arena. The artist painted a mural and sent the painting off to Crovatto Mosiacs, which is located in a little town in Italy. The town’s chief industry is making venetian glass mosaics (too expensive to have done in the States). To make venetian glass workers pounded out very small pieces of colored glass and glued each piece with the flat side directly down onto sheets of paper. A wooden panel was then placed on top of the jagged sections, and shipped to Detroit. The panels were then installed on the station’s walls. Then the sheets of paper were removed from the glass pieces to give us this finished art piece. The design is based on astrological signs from the 17th century. 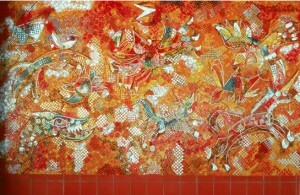 Two Venetian glass mosaics capture the energy of this busy station with bright, flittery colors. Mr. Kamrowski, a master of the surrealist movement, has based these murals loosely on mythological and astrological figures of the seventeenth century. Funded By: A. Alfred Taubman, Michigan Council for the Arts, Detroit People Mover Art Commission.